Nigeria, often regarded as the giant of Africa, is a big country. This country is made up of a total of 36 states and a federal capital territory known as Abuja. Some states in Nigeria are doing well economically than the others. Apart from Lagos which a lot of people know that is the richest state in the country, people hardly know other states of the country that are rich. Our purpose is to educate the public, and this is just another educative piece. 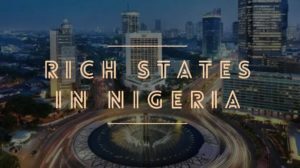 In this article, ‘ the Top Rich States In Nigeria And Their Corresponding GDP,’ we’ll discuss some rich states in Nigeria. Lagos is clearly the richest state in Nigeria. This state ranks as the richest in the country with a GDP of about 33,379 million USD. The state is a hub of economic activities, and it is known to be the most important state in the country. This state is capable of running smoothly independently of the federal government of Nigeria. Not long ago, the state embarked on a plan to generate its own electricity. International reports have it that Lagos State will be a better country than Nigeria if it should exist independently of Nigeria. The state is one of the best places to start a business in this country. Furthermore, the state used to be the federal capital, before Abuja was made the federal capital. Rivers State follows Lagos State on the list of rich states in the country. Rivers is a state in the south-east of Nigeria. It is chiefly occupied by the Igbo ethnic group. This state house a very popular city in the country, Port Harcourt. The state is one of the oil-producing states in the country. Rivers has a population of 5,198,716, persons, allowing it to be the sixth most populous in the Federal Republic of Nigeria. Minority ethnic groups in the country include; Ikwerre, Ibani, Opobo, Eleme, Okrika, and Kalabari, Etche, Ogba , Ogoni, Engenni, Obolo and others. Rivers State is surrounded by: the Atlantic Ocean, Imo State, Abia State, Anambra States, Akwa Ibom State, Bayelsa State and Delta State. The state is nicknamed ‘Treasure Base of the Nation’, and its indigens are known as “Riverians.” The GDP is about 21,073 million USD, and its Naira equivalent is about 7,376 billion NGN, using 350 NGN as a USD equivalent.